In August 2003 I have written a draft of the show, that has been represented by GAV milites group to the Ludi Savarienses festival that it is hold every year in Szombathely city (Hungary). It follows the complete text of the show with a brief introduction. Savaria Carnival (www.savariakarneval.hu) is one of the more beautiful and imposing Roman festival for organization, services and shows, which I have been lucky to participate. In that occasion the invitation has arrived by email and the group asked me to do the contract and to manage and to hold the relationships with the organizers. When we came to an agreement and after we received the signed contract by fax, I decided to prepare a small trace for the show in Hungarian earth, I was inspired by the experimentations learned in the Legio Phoederalis of the Federazione Ars Dimicandi®. to make themselves understood to the public through some brief introductions. When we came in Hungary, we have tried and correct it and after all it has kindly been translated in Hungarian by our comes, Miss Vera Somogyi, that then she has given it to the festival speaker. Her precious help has allowed us to avoid the reading in English, facilitating of fact the understanding of the show. I propose the various sessions that constituted the original show, in the red panels it is described the behavior that the group had to simulate under the guide of the centurio or optio (I didn't know previously who would have filled this assignment), instead the rest is the text read by the speaker. Meanwhile the speaker reads the introduction part to the show, the legionaries (in agmine formation) commanded by the optius or by the centuirione, they go around the arena or their assigned space. Good Morning/Afternoon to everybody, we are very happy to participate in your manifestation and we will try to show you as the Roman soldier dressed himself, lined up and fought in the Roman army. We are an Italian reenactement Group called Legio I Italica, coming from the district of Rovigo, a city near to Venice. What you will see today derives from the experimentation of the Federazione Ars Dimicandi®. The Federazione is born for spreading the Roman military discipline as a sport, that absolutely means to practical and utilitarian purposes of techniques and armaments. In the Federazione we are called Cohors Adrianenses. Introduction. A brief description of the history of the Roman legion and our specific legion and the equipment of the legionary particularly hastatus and princeps. Movements of the cohors. How the lines of legionaries were lined up inside the cohors for allowing the exit and the entrance of the manipuli. Catervarius. How the soldiers get ready to fight. Testudo. How the legionaries were lined up in the manipulus for forming the testudo and for withstanding the throwing of arrows and iacula. Balteus. The fighting In Gradu Stare. Every section will be preceded by a small theoretical introduction that will help you to appreciate and to understand the show that we will offer you. Well, Let's go!! To tell and to describe the Roman legion is a thing that goes out of our show. So, I will give some important and essential notions to understand our reenactement and the parts of the legion that we reproduce during the exhibition. We are inspired by the Legio I Italica, legion wanted by Nerone in 67 AD for a hypothetical mission in the East. For this motive our equipment and the way of fighting it is inspired to the first century AD. The military history in Rome is identified traditionally with its legions. This is not completely exact because many other were the specific factors that contributed to its greatness. However never any other army, ancient or modern, it had similar soldiers: always formidable fighters and not for limited time but for centuries. We now see how the legion was formed particularly the cohors and the manipulus. The cohors with the reform of Gaius Marius was composed of 600 soldiers, formed by the union of 3 manipuli, one of hastati, one of principes, one of triarii, every one composed by 200 men. Every soldier that you see corresponds to a manipulus (that's 200 legionarii). So, this line up consists in 4 cohortes, for a virtual number of 2400 men. The manipulus was born for the necessity to have more mobile departments and able to act with more elasticities. Hastati and principes counted 120 men for every unity and triarii 60 fighters. What you see is a simple manipulus: every line od soldiers corresponds to 40 men, for a virtual number of 120 men. Hastatus: he formed the first line, he was equipped by a long hasta, a lorica segmentata and a rectangular shield. He served for answering to the first attack. Princeps: he formed the second line, he was equipped with a lorica hamata and a round shield. He was very skilled and experienced in the fight. 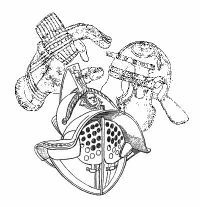 All the legionaries wore a protective helmet, a pair of spiked caligaee, a gladius a pugium and a cingulum. In our exhibition we don't use the triarii, so we have increased the number of cohortes. You can see 2 cohortes formed by 4 manipuli, 2 hastati and 2 principes. Now you will see the movements and the commands that regulate the disposition of the manipuli in the cohortes. What is the catervario? It was a particular training game of the legionary used to prepare the soldier to the real fight. The iron swords were not used but wooden swords, called rudis, and who was struck he stayed to earth until one of the two groups had won. However it needs to see how the soldier used the weapons and he defended himself. You will see various types of attack and defense, the use of the shield, fundamental for the Roman soldier and the particular form of the helmet that it protects the shoulders and the face of the miles. Now the optius or centurio will name a commander for the two line up and will have beginning the catervario fight. The testudo is a formation of attack to protect the soldiers from the bullets of the enemies. I invite 5 or 6 people of the public to enter and to get ready themselves to launch the iaculae against the central part of the testudo, following the indications of our legionaries armed with iaculae. What is the balteus? It is a leather strip destined to sustain the sword. Such as safety belt was used for holding back the miles that was fighting in the first line. It also served for calling him back when he had to take over the miles in the second line, fresh and ready to fight..
Now you will see some introductory example to understand the operation of this system. You will now see the fight in gradus stare, with some hostile soldiers that will hinder the first files. The city is situated 220 km from Budapest, next to the Austria frontier. It was founded by the "divine" emperor, Claudius in 43 BC as one of the Northern outposts of the empire. The town prides in, is well aware of, its traditions and consciously keeps them alive. 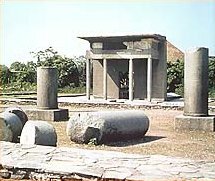 Relics are appreciated, sites of ancient pomp have been laboriously unconcealed and memories of long forgotten times have been carefully collected. Iseum, the largest sanctuary of the Egyptian Isis-cult found in the Pannonian territory is among the most precious prides of the town. The association denominated Federazione Ars Dimicandi (from now on the Federazione), it has the purpose to organize and to coordinate the practice and the diffusion to international level of the denominate sporting activities arsdimicandi, through the experimental archaeological recovery of the fight disciplines of the antiquity Greek-Roman: the cesti boxing, the luctatio, the pankration, the gladiatorial and military ancient fencing. The Federazione doesn't have ends of profit and has the purpose to valorize, through the practice of the ars dimicandi, the dignity and the emotional contents determined by the direct experience of the athletic gesture, involve impassioned, athletes, historical groups, reenactors, collectors, operating of the scholastic education, model makers and anybody else individual or collective subject that desires to be formed in such disciplines. For the peculiar infrastructures required by the training in the disciplines of the arsdimicandi, the activities of the Federazione have carrying out during the Legio Phoederalis or more simply the assemblies. Following the difficulties derived by the geographical distances of some members of the Federazione, and to avoid a preclusion to the good course of a constant technical updating, the Federal activity it is wide to every other place where can be partially realized. The Federazione is born for spreading the Roman military discipline as sport, that absolutely means to practical and utilitarian purposes of techniques and armaments. It means that the Federation organizes its Legio Phoederalis on the base of unity and departments "confirmed" that they carry out to functional demands. These unities are recruited among the single ones or the local associations that stick to the diffusive and sporting finalities of the Federazione.